Beginning Band information will be going home with students soon. Please cut the form off the brochure and return it to school by Sept. ????. The instrument rental night will be on Sept. 26 @ 6:00 at Newman. It is important that students practice the music we are working on in class for at least 20 minutes every day. Please help your student create a regular practice schedule. 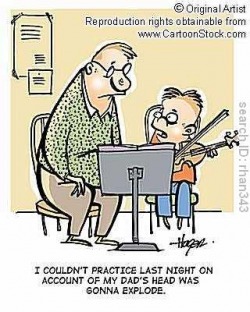 Yes, practicing is not always fun, but there are ways to make it fun and the payoff of practicing will be great!